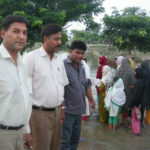 For a number of years, Missionary Services of Pakistan, headed up by Pastor and Mrs Yaqoob Ilyas, was our partner in Lahore, Pakistan. Their core project focussed on the needs of Christian inmates in five prisons in the region, including a women’s prison. During their fortnightly visits Pastor Yaqoob and his team taught from the Bible and offered prayer and counsel to the inmates. Besides providing valuable emotional and spiritual support to inmates, MSP also worked to help the families of those incarcerated in whatever ways they could, material and otherwise. medical care for Mrs Ilyas who has a serious medical condition. We wish them all the best and lookforward to working with them on other projects in the future. 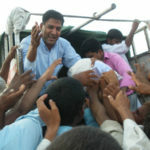 In September and October 2009, Missionary Services of Pakistan made a number of trips into areas affected by civil unrest to distribute food, and other material aid to those who have suffered the loss of homes and property. All the donations of money and goods were raised locally. 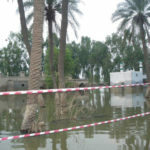 During and after the 2010 floods in Pakistan money and material aid was raised both locally and in the UK to make possible the purchase and distribution of needed essentials to victims of the disaster. From April 2007 to the end of 2010, our partners Pastor and Mrs Yaqoob Ilyas ran adult literacy courses for disadvantaged adults in Green Town, Lahore. Drawing on their own professional teaching experience they ran free classes in Urdu six evenings a week. This program enabled 30 formerly illiterate adults to be able to fluently read and write Urdu, greatly improving their chances of securing stable good quality employment and of course enriching their lives in many other ways.